For symposium presenters, ACASA will provide laptops, projectors, and screens. The use of personal laptops is not advised. Welcome Logistics Information is available here. 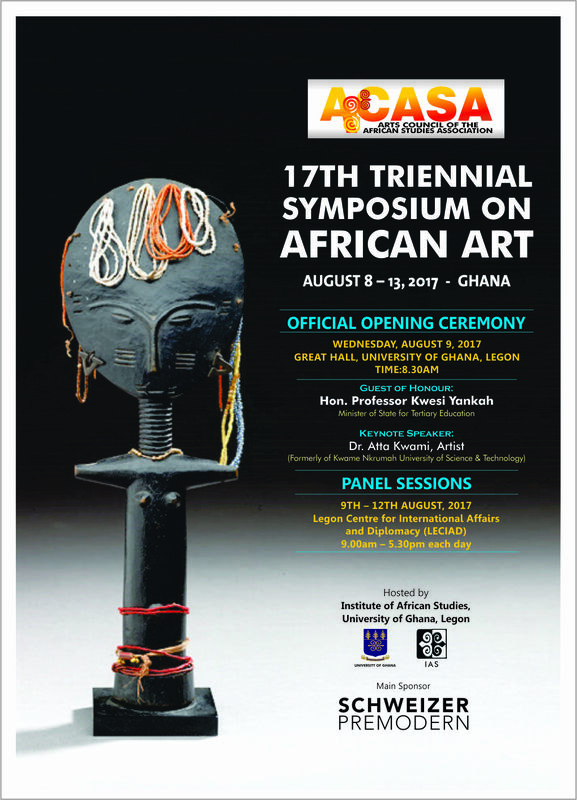 The July 1 deadline no longer applies to registration for Post-Symposium Tours in Ghana. Tour reservations are now open until spaces are full. See here for a description of the tours. Download the registration form here. Triennial Participants – Call for Book Donations! ACASA has distributed all of the funds it raised to assist colleagues to travel to our upcoming Triennial Symposium, and we need your help once more. To those who have given, thank you for your generosity. If you’ve not yet given or are able to lend more help to this cause, please do so. Even small donations help a great deal, and larger ones are particularly appreciated. Donations may be made electronically or by check. Thank you warmly for your help! The elections deadline for ACASA board candidates has been extended to Friday, June 9th, at 5pm EST. Members, please vote now! ACASA is pleased to announce the program schedule for this year’s symposium. Please see here for details. Instructions: Members must log in to vote and then visit the link HERE OR select About from the menu at the top of the page. A drop down menu will appear. Select Board Election 2017. Once you’ve landed on the election page, read the instructions and vote for up to five candidates. Press Submit at the bottom of the ballot. Voting is active starting Monday, May 22 and ending at 5pm (EST) on Friday, June 9. Good luck to all of our candidates! According to recent reports, the Trump administration is planning to completely eliminate the National Endowment for the Arts (NEA) and the National Endowment for the Humanities (NEH) (See “Trump Team Prepares Dramatic Cuts”). As ACASA members in the US know, many of our exhibitions and research projects could have happened only through funding by the NEA and the NEH. Relatively few people in the US are passionately concerned with the arts and humanities; relatively few understand the essential role of the arts and humanities in preserving a robust democracy and bridging cultural differences. Therefore the NEA and NEH could be easily eliminated if people do not speak out in their support, and as members of an African arts organization, you could make a big difference. The Board of Directors of ACASA asks you to join us in contacting your elected representatives in the Senate and Congress. You can find the names and addresses of your senators here, and of your congressional representative here. When you contact your representatives, please let them know you are a member of ACASA, and that we are working with other organizations to advocate for continued public funding for the arts and humanities. Networks to support artistic and scholarly freedom are now expanding. To join with this growing community of active artists, curators, teachers and researchers, please visit the National Humanities Alliance and Americans for the Arts. Only through collective action can we ensure continued public funds for creating and researching art in a free and open society. The Arts Council of the African Studies Association is a non-political organization that exists to exchange ideas and proficiencies across borders. As an organization we denounce the Trump administration’s executive order banning all refugees from entering the United States for 120 days on the grounds that it is racist and xenophobic, and thus stands in direct opposition to our mission. It blocks Syrian refugees from any access to the US for an indefinite period, and denies passport-holders from seven, predominantly Muslim nations – Iran, Iraq, Libya, Somalia, Sudan, Syria, Yemen – entry into the country. This ban blatantly discriminates against individuals from Africa, the Maghreb, and the Middle East, affecting many members of our community. ACASA joins other academic associations in calling on the President and Congress to lift the ban and calls on all elected officials, regardless of party affiliation, to work urgently and vigorously to overturn this discriminatory order that limits collaborations with researchers and scholars from the nations listed in the executive order and violates US and international law as well as human rights on a global scale.